As recently as the 1940s, steelhead were abundant and frequently caught in Southern California’s coastal streams. Historic records from the National Marine Fisheries Service (NMFS) show several local creeks with impressive pre-1960s abundance. 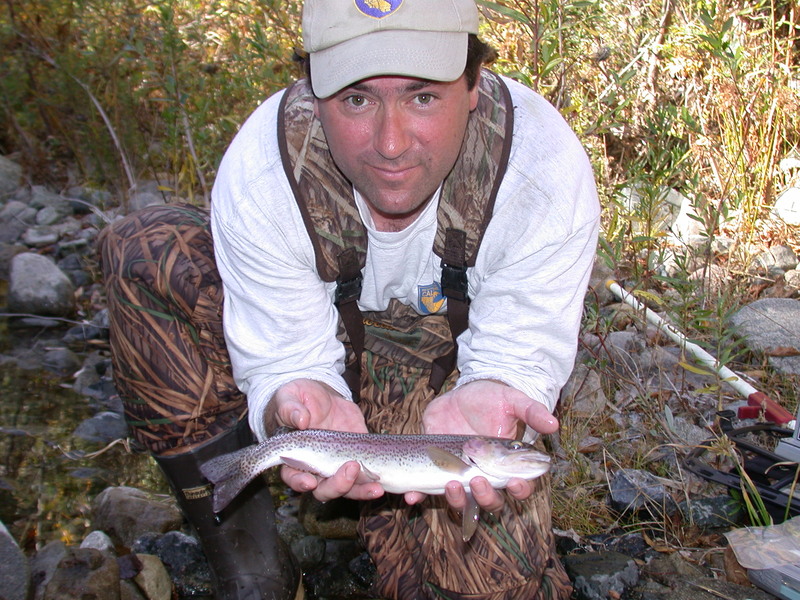 The Ventura River recorded runs of several thousand fish annually during that time. Fish numbers in the Santa Clara River were estimated at 7,000 to 9,000. The Santa Ynez River saw the largest recorded run south of San Francisco, some 20,000 to 30,000. Steelhead south of Malibu Creek are considered scarce since limited records of their presence exist. Most of the records of fish in streams like the San Luis Rey, Santa Margarita River and San Mateo Creek come from California Department of Fish and Game fisheries reports, angler information and, essentially, word of mouth. While fish records were not well documented in these Southland waterways, anecdotal information shows that steelhead were routinely encountered by anglers. Unfortunately, as Southern California development increased in the early 1950s, consistent steelhead presence in this portion of the state was coming to an end. STEELHEAD TROUT BEGIN THEIR lives in freshwater coastal creeks. During heavy winter storms, sea-run adults enter their home creek at the mouth, where freshwater meets the sea. They make their way up to the spawning grounds and spend a few days releasing eggs into the creek. After that, the adult steelhead swim back downstream to the ocean, leaving the eggs to develop in the stream. The steelhead fry develop in the creek and are known as resident trout. After a year of growth, they usually go through a change called smoltification. This process prepares them for their journey from freshwater to salt. Once these yearlings enter the ocean, they’ll spend a few years roaming the coast before they return to the same creek as adults to start the process all over. This, of course, is the best-case scenario for the steelhead life cycle. Many environmental factors need to be in place for this reproductive strategy to be successful. If even one of the crucial factors is not available to the returning sea-run adults, they’ll be unable to spawn and an entire year-class will be lost. 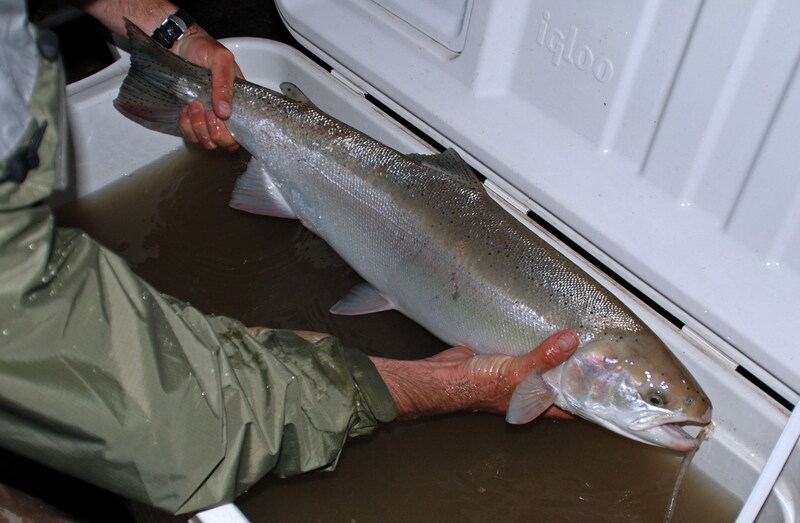 Obviously, the most important factor for returning steelhead is water. As development in Southern California increased, the landscape began to change and human progress was bad news for steelhead runs that far south. Increased development further taxed the groundwater of many watersheds, forever altering the amount of available water for most coastal creeks and streams. Reduced flows started to impact stream access for returning steelhead adults. Creeks that would routinely be open to the ocean most of the year are now disconnected from the surf by hundreds of yards of sand. Breaching these freshwater lagoons usually takes one of the massive but infrequent winter storms, and even then access to the ocean may be measured only in days. Timing is everything, and if the returning adults aren’t at the mouth in that brief access window, they don’t get in to spawn. If being unable to consistently reach their spawning grounds wasn’t bad enough, returning steelhead now have to share their home creeks with nonnative predators. Largemouth bass, catfish and red swamp crayfish, intentionally or unintentionally released into creeks and streams all over California, readily feed on the eggs and fry left behind by steelhead. If the new neighbors eat your kids, your species days are probably numbered. The final nail has to be the most invasive step in altering a drainage. To supply a growing population, dams were constructed to impound stormwater runoff. These structures blocked upstream access for returning steelhead, essentially cutting off the spawning grounds. Further controlling the runoff and to stabilize the potential for flooding, most creeks and streams running through populated areas are channelized, straightened to fit the geometry of progress and absolutely covered with cement. A stream once surrounded by lush riparian habitat, crucial to early fry development, is lost forever under the push for development. These two trout were discovered in Conejo Creek and Santa Clara River, but sightings are few and far between these days. AS SOCAL’S POPULATION grew, no one seemed to notice that the steelhead had disappeared. Sightings dropped off significantly in the 1970s, and returning fish have all but disappeared since then. With the dwindling numbers, NMFS declared the distinct population segment known as the Southern California Coast steelhead endangered in 1997. Unfortunately, this DPS only went as far south as northern San Diego County’s San Mateo Creek. Work conducted by the California Department of Fish and Wildlife there in the late 1990s convinced NOAA to extend the segment to include Los Angeles, Orange and San Diego Counties in 2002. In 1999, I began monitoring a newly discovered population of steelhead in the creek. A local student had caught a trout at its mouth and knew enough to contact CDFW regarding the sighting. We deduced that the trout had been emigrating to the ocean. This meant that the spawn that had produced the fish, and the individuals we discovered upstream, had occurred the previous year, in 1998. The main stem of San Mateo Creek is chock-full of nonnative exotic fish – species that would surely consume eggs and fry left by spawning steelhead. A survey of Devils Canyon Creek, a tributary to San Mateo, revealed more native trout and an absence of the exotic predators. It was concluded that the original steelhead adults swam up the main stem of San Mateo Creek, passed the schools of exotics, continued up the Devils Canyon tributary and spawned there. 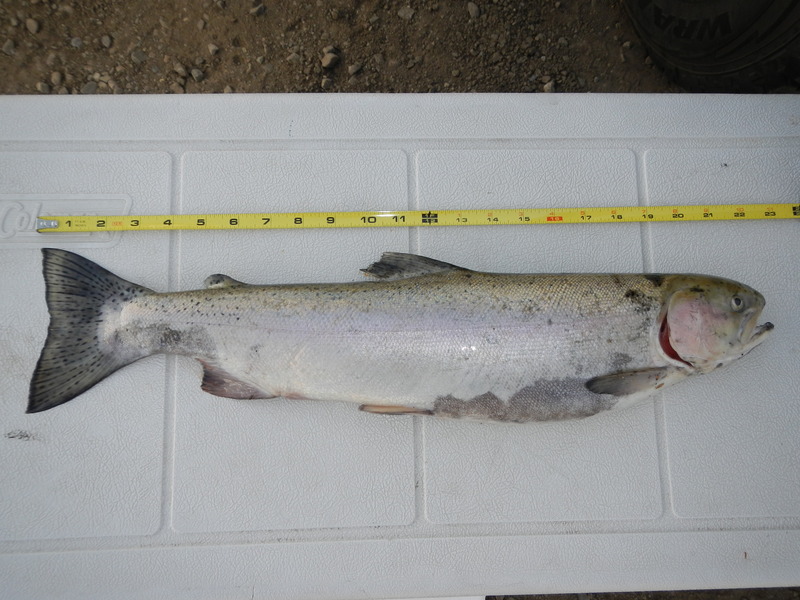 Over the next several years we monitored the remaining San Mateo Creek steelhead. We recorded second-year fish in the main stem that didn’t make it out of the drainage before the lagoon closed again. We watched as they competed for resources with the nonnatives and eventually disappeared. 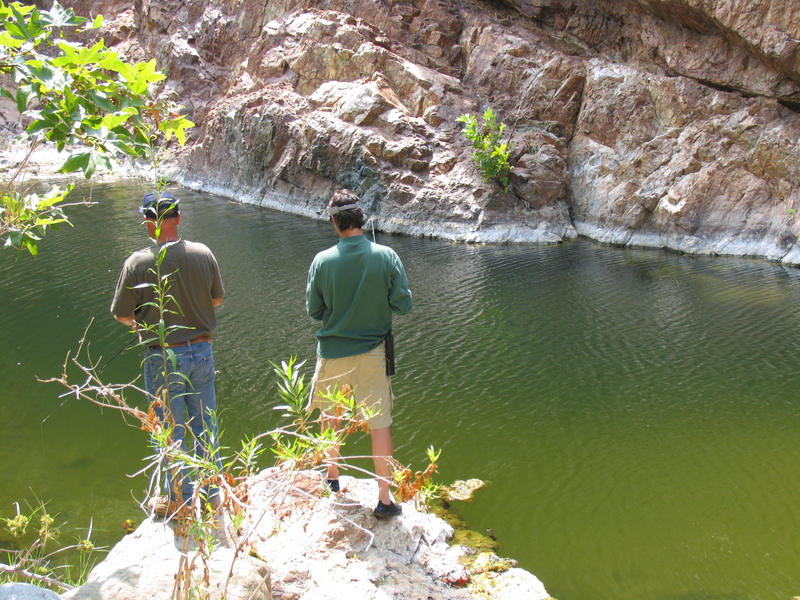 Conditions in Devils Canyon were good enough for the resident trout there to spawn in 2002. Fry and young of that year were monitored for another year until they moved down to the main stem of San Mateo Creek, but they also disappeared. 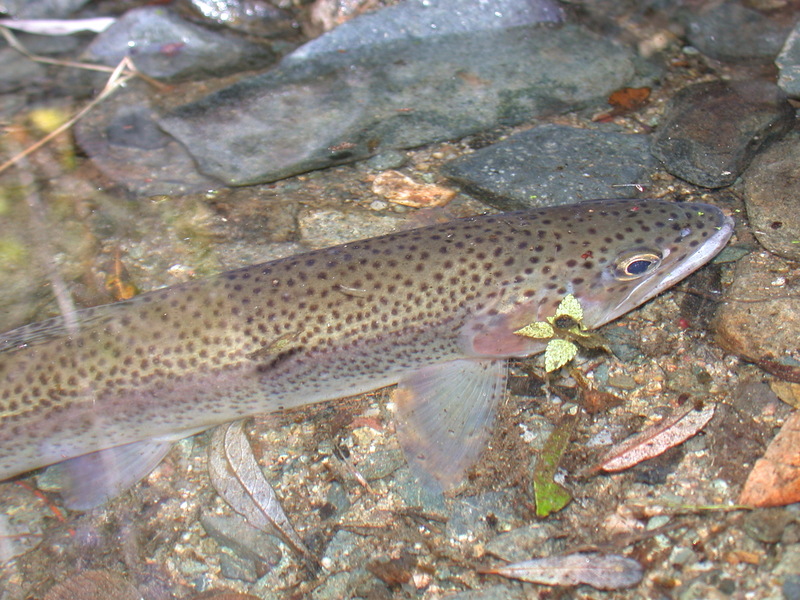 The last adult fish was observed in Devils Canyon Creek in 2003. After that, no other steelhead trout were observed in the drainage. During that four-year monitoring program, we made attempts to rid the creek of nonnative fish. We pumped pools dry and removed all the exotics. We dragged seines through the larger pools and cleaned the ponds of anything exotic. 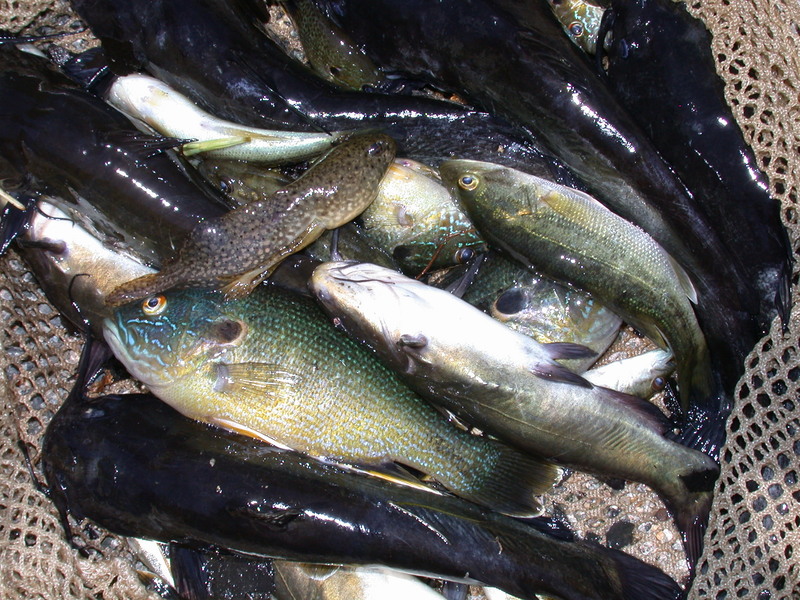 Largemouth bass, green sunfish, black bullhead catfish and crayfish were collected, counted and disposed of by the thousands. Despite the effort, we knew all we were really doing was evaluating removal techniques and delaying the inevitable. EXOTIC SPECIES REMOVAL IS an important part of any drainage restoration, but you definitely have to pick your battles. The species in San Mateo Creek are self-sustaining and reproduce successfully in the drainage. Additional individuals are added to the creek from upstream pond sources. In short, no matter how much focused removal work is done on the stream, San Mateo Creek will always have exotic fish species present. It was during this lengthy monitoring project of the Southern California Coast steelhead DPS that I began to fully understand the tenuous and desperate plight of this stock. The San Mateo Creek watershed is unique. It is one of the only undammed streams without channelization in this portion of the state. It winds its way from headwaters on U.S. Forest Service property down to and across the open plain of Marine Base Camp Pendleton before it occasionally empties into the Pacific Ocean. The base is the reason that this stream has remained mostly in its natural state; one can only imagine the countless housing developments, shopping malls and the supportive infrastructure that would exist there if the federal government hadn’t scooped it up to train troops. I began to realize that the presence of the base was the only reason we had discovered the steelhead in the creek. The discovery of steelhead and the subsequent monitoring program that began in 1999 saw the last recorded run south of Malibu Creek. Periodic sightings of adult steelhead either attempting to enter creeks close by or stranded in coastal streams have occurred over the last 15 years or so since the discovery. This illustrates that despite the obstacles, adult fish are still trying to make it to their home creeks and to the spawning grounds. Southern California Coast steelhead depend on reproducing in coastal creeks to replenish their stock. Without access, no new trout will be added to the coastal population. Eventually sightings will drop off as the adult population dwindles. Editor’s note: For more on Southern California Coast Steelhead, check out westcoast.fisheries.noaa.gov/protected_species/salmon_steelhead/salmon_and_steelhead_listings/steelhead/southern_california.